This post is an updated version of a post originally published on December 3rd 2014. 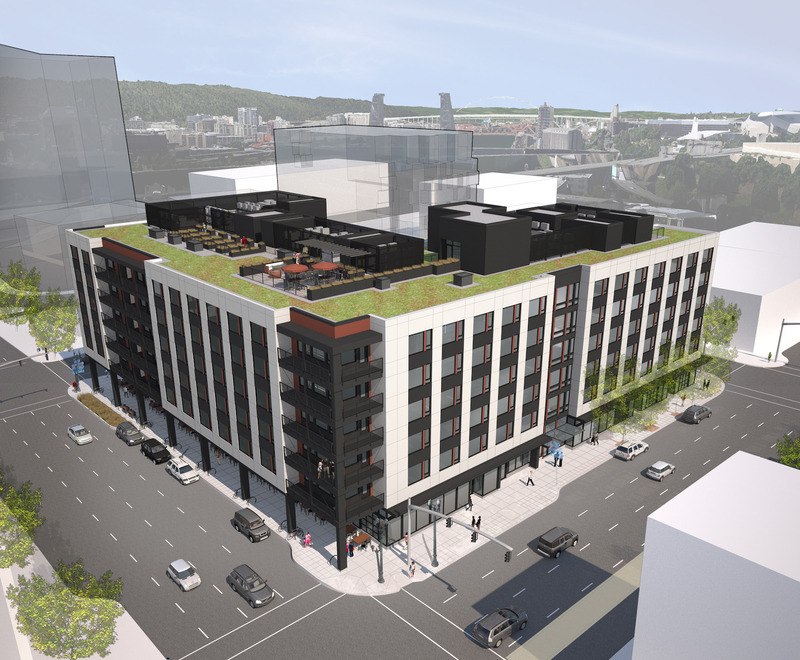 Construction is underway on 419 E Burnside, a 6 story mixed use building in the Central Eastside. The building will contain 157 residential apartment units, as well as two ground floor 2 live / work units. 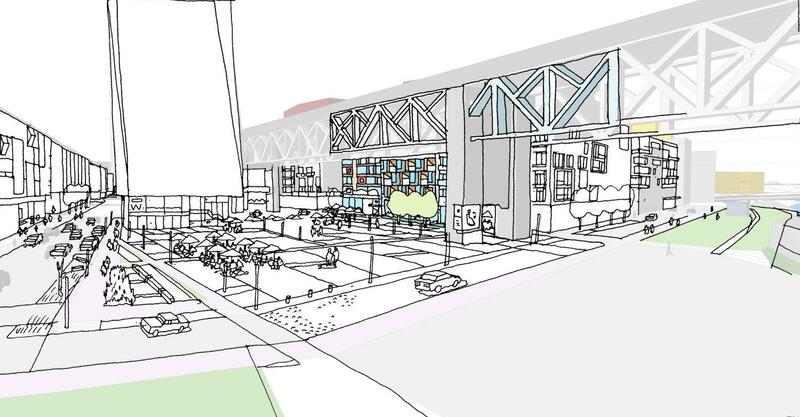 Continuous retail spaces will front onto E Burnside. 50 parking spaces will be provided for residents, as well as 12 parking spaces for the adjacent Central City Concern building, which will remain. Bike parking will be dispersed throughout the building. The design of the building is by Portland based Myhre Group Architects for Dallas based developer Trinsic Residential Group. The Portland Development Commission and ZRZ Realty came to an agreement over development at the Zidell Yards. The Development Agreement, backed by $23.7 million of public money, will lead to 1.5 million sq ft of commercial and residential development. The Willamette Week published rebuttals to the 5 Myths About Portland Apartments. 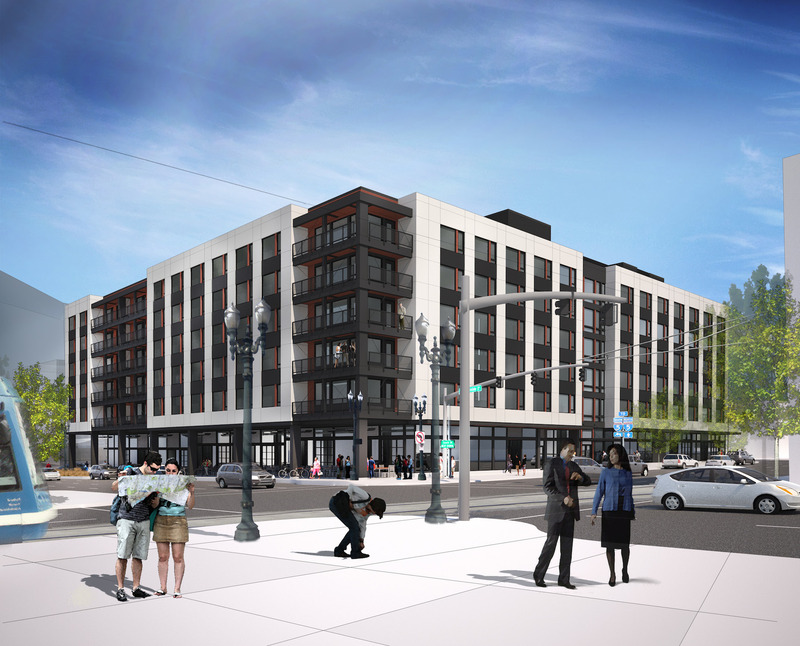 The Oregonian published the first images of what the massive development at 1510 NE Multnomah might look like. The three building development could include as many as 1,125 units. Multnomah County voted to allow Central City Concern to sell a quarter block parcel to developer Trinsic Residential Group. The land deal will 419 E Burnside to move ahead. A grand opening was held for the Hotel Eastlund, the newly renovated hotel in the Lloyd District. The Daily Journal of Commerce published a photo gallery, with shots of both the exterior and interiors. Construction is about to begin on the first building of the Dharma Rain Zen Center. The center will be built on a site on NE Siskiyou St, which was used for years as a dump for construction debris, leaving the site too contaminated to develop. The Buddhist nonprofit bought the site in 2012, and has worked since then on the site remediation. A warehouse at 2330 NW Raleigh St is set to replaced by a 40 new apartments. The Portland Chronicle looked into the history of the property about to be redeveloped. Eater Portland reports that the Pine Street Market has named its latest tenant: Peruvian restaurant Andina. The market is set to open in November. A gallery in the Daily Journal of Commerce showed the progress on The Abigail, the latest affordable housing project in the Pearl. The City Council heard evidence for and against the proposed demolition of the Buck Prager Building at 1727 NW Hoyt. The hearing will be continued on December 18th. The Design Commission offered Design Advice on the St Francis Park Apartments and the 4th & Harrison student housing. A Design Review hearing for Jefferson 14 was postponed until December 18th. In an article titled ‘Arcade Games Are Better III‘ Places over Time wrote about 419 Burnside. In an article about affordable housing in the North Macadam Urban Renewal Area, the Oregonian reported that the Portland Housing Bureau are planning a a mixed-use project to include affordable housing at SW Moody & River Parkway. The blog History Treasured & Sometimes Endangered wrote about an art installation at the Mariner’s Home Building on NW 3rd and NW Davis. The building is currently being converted into the Society Hotel. 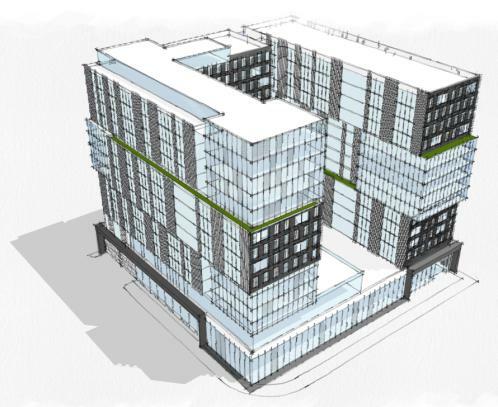 The Portland Chronicle published photos of the site at 4937 SE Division St set to be redeveloped as 134 apartment units, with SERA as its architect. The Portland Business Journal wrote about construction progress at the former Red Lion, currently being transformed into the Hotel Eastlund. The Daily Journal of Commerce reported that OHSU is close to signing contracts for two South Waterfront projects [subscription required]. According to the article, ZGF Architects have been chosen to design the Center for Health & Healing II and SRG Partnership have been chosen for the Schnitzer Campus Building III. 419 E Burnside. The ghosted outlines behind the building represent Block 67 and Block 75. The City Council heard evidence on the rezoning for the Multnomah Athletic Club Block 7 apartments. No vote was taken, and the hearing will be continued on January 8th. The Historic Landmarks Commission approved the design for Block 8L, a new mixed use building in Old Town. The Design Commission discussed the Tess O’Brien Apartments, 419 E Burnside, the Hilton Curio Hotel and the Whidden & Lewis building renovations. A Pre-Application Conference was requested for the Grove Hotel, and the first images were released. The Portland Chronicle posted construction photos of Vallaster Corl’s Lower Burnside Lofts. 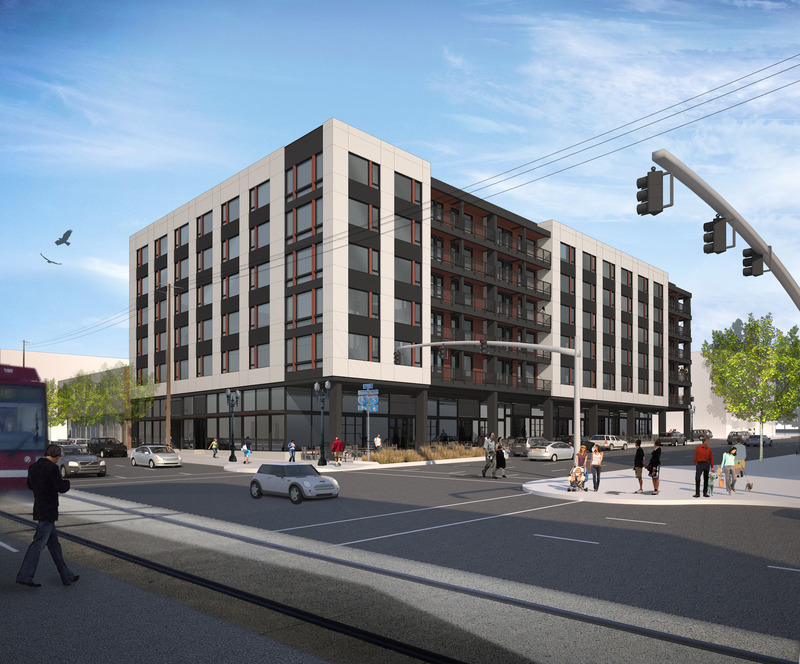 The development boom at the Burnside Bridgehead was the subject of another post at BikePortland, which included coverage of Skylab’s Block 67, Works Partnership’s Block 75, Myhre Group’s 419 E Burnside, and Guerrilla Development’s Fair Haired Dumbbell. The Daily Journal of Commerce published photos of GBD Architect’s Block A Apartments under construction in the Lloyd District.